I am simply tickled about one of my most recent fashion items. The draped kimono. 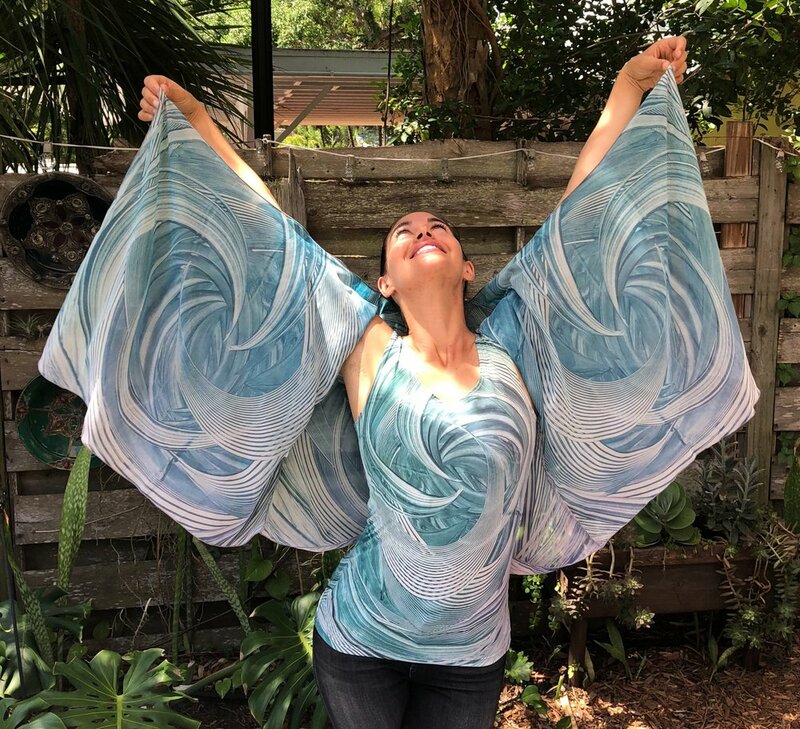 Chiffon Draped Kimonos with my designs elevate women to amazing heights of beauty, flow, and grace. We intuitively know that we feel better wearing particular pieces of clothing. Women feel joyful wearing these draped kimonos, both casually or dressed to the nines. Offering you meaningful designs on an item that flatters all ages and body types feels so good and right to me. It is my small way of bringing joyful energy into the world in the form of womens clothes. Women who have visited my gallery are the experts who have taught me the countless ways they can be worn. From young women in their twenties through women in their nineties. I am amazed at the possibilities contained within this rather simple cut. Design Names Left to right: Gratitude Blue, Woohoo!, Cascade, and Gratitude. So many variations (like back-to-front and upside down) on how to tie a Draped Kimono are surfacing right in my gallery and I’m trying to keep up! The best way for me to do this is via photos and Youtube videos. My Youtube Channel is now official and you are welcome to visit. Just click the link below and enjoy the many ways draped kimonos may be worn. I also invite you to subscribe to my page as it will help nurture my creative flow! All of my Draped Kimonos are direct translations from my paintings. All are named with an Uplifting Title and an accompanying Inspiring Story. It truly is Clothing to Elevate Your Spirit!